Packmage CAD is a software that can change the traditional packaging design software. It can be used in packaging, dielectric sample, die cutter, printing and other fields. First of all, the software will introduce the concept of “change”, drawing boxes is just like magic. You can use the box templates in the box template library, and by inputting the paper dimensions of the box, you will conjure up an expand picture which can be exported to PDF, DXF vector formats for later using in Photoshop, Illustrator, CorelDRAW, AutoCAD and other softwares. Secondly, the software introduced the function of 3D magic, you can import the design draft into Packmage CAD, and match it with the structure properly. Then you can watch the 3D modeling, every corner, every side. The most important thing is that the other 3D softwares on the market are fixed to 10 templates, far from the free play at will. Finally, the step and repeat. It is to put a single cutting die graphics and design image overlap , then to step and repeat die cutter graphics, and to render design draw to each cutting die graphics, eventually get knife template and plate required files. This can improve the work efficiency, accuracy, and ensure the consistency of the knife mold files and plate. 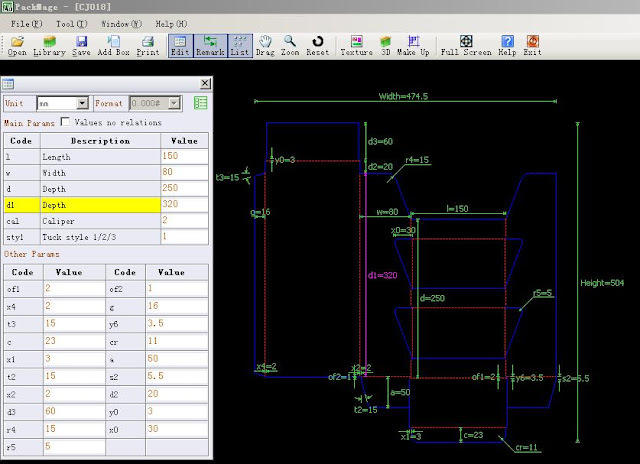 Packmage CAD provides smart ,array and manual step and repeat.